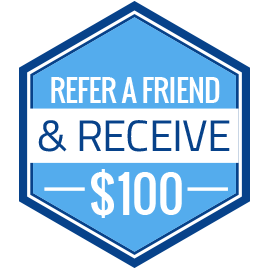 Refer a Friend To Our MMA, Kickboxing, or Brazilian Jiu Jitsu Class and Get $100! When you start taking MMA, kickboxing, or Brazilian jiu jitsu classes, there’s one thing we always encourage: make new friends. After all, you’re going to be physically interacting with these people, and while rivalries do happen, they’re most often between new friends who are trying to push each other to be their best. This is true whether you’re here for adult or kids martial arts classes. But what about the friends you already have? Do you think they’d like to come in for some martial arts classes too? If so, you can both get something out of it! Get Them Healthy: It can be hard to see a friend put on lots of unhealthy weight. If you’re concerned that they’re spending too much sedentary time at a desk, inviting them to your martial arts classes is a great way to encourage them to be healthy without saying “you should exercise more.” Of course, Brazilian jiu jitsu classes aren’t just about getting healthy. There’s also the aspect of self defense. Get Them Protected: There are many reasons why people come to us for martial arts training, and one of the big ones is self defense. We all want our friends to be safe, and bringing them in can teach them a great skill so that they can better protect themselves. Get Them Discipline: Let’s say you have a friend who has discipline issues. Now, this friend could be 12 years old or they could be 35 (they might even be 65, why not?). If you’re worried that your friend is a little misguided in life and isn’t using their time or energy the best way they could be, martial arts classes are a great place for them to release energy in a positive way while also learning discipline that will calm their mind. It’s a great way to get a positive connection between the body, spirit, and mind that some people really need. Get Them In Here! : If you’re enjoying your martial arts classes, there’s probably no reason why your friend won’t enjoy it too. Let them know what you like most about it, and how it’s improved your life. You can even encourage them by telling them they can get two weeks of classes for free. Get $100! : This one is pretty obvious. If they sign up for classes, you get $100! Hard to beat that, isn’t it?